As we saw in my previous article, if application containers in multiple CDBs need to have the same application definition (for example, same tables and PL/SQL packages), then the application can be kept synchronized across CDBs by the use of proxy PDBs. We also saw that using proxy PDBs with application containers, a query using the CONTAINERS clause that is issued from the master application root can aggregate application data across CDBs. As a result, we can build location-transparent applications which can aggregate data from multiple sources that can be in the same data center or distributed across data centers. In this article, we will further explore the use of proxy PDBs with application containers to load balance an application across CDBs. In order to keep an application synchronized across CDBs, a proxy PDB can be created in the master application root for every application root replica in another CDB. Consequently, application PDBs plugged into the master application root and various application root replicas can be synchronized so that they can access the latest version of the application while storing PDB-specific data in one or more metadata-linked tables. 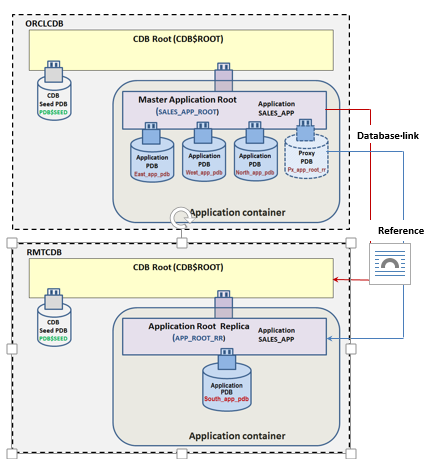 This leads to the possibility of load balancing an application across CDBs by distributing the application PDB(‘s) across synchronized application containers. In this article, I will demonstrate that when an application is load balanced across CDBs by relocating application PDB(‘s) across synchronized application containers the application code to aggregate application data across CDBs need not be changed at all. We have an Oracle database 12.2.0.1 CDB called orclcdb as shown below. Within this CDB, besides the CDB Seed PDB pdb$seed, we have an application container with the master application root sales_app_root for the sales application (sales_app) of an organization. The application container sales_app_root houses three application PDBs; i.e., north_app_pdb, east_app_pdb and west_app_pdb, which support the sales_app application for various regional offices of the organization. We also have another 12.2.0.1 CDB called rmtcdb having the application root app_root_rr, which is a replica of the master application root sales_app_root and is kept synchronized with it by means of a proxy PDB px_app_root_rr . The application PDB south_app_pdb for the south zone regional office is plugged into the application root replica app_root_rr. Any changes made to the application in the master application root sales_app_root are propagated to south_app_pdb when it synchronizes with app_root_rr. While sharing the structure of the metadata-linked customers table stored in the master application root sales_app_root, each application PDB can store region specific customer data in the table. At present, there are three application PDBs in the CDB orclcdb and one application PDB in the CDB rmtcdb. All four application PDBs are synchronized. Now, in order to load balance the application sales_app across CDBs orclcdb and rmtcdb, we will relocate one of the application PDBs in CDB orclcdb; say, north_app_pdb, to rmtcdb so that the configuration becomes as shown below. Subsequently, when a query containing the CONTAINERS clause is issued in the master application root sales_app_root, it is executed recursively in each application PDB. The query executes in the non-proxy open application PDBs (east_app_pdb and west_app_pdb) in the current application container (sales_app_root) and returns results to the master application root. The query, when propagated to proxy PDB px_app_root_rr in the current application container (sales_app_root), is sent to the referenced application root replica app_root_rr in CDB rmtcdb, where it is executed in the open application PDBs (north_app_pdb and south_app_pdb) plugged into app_root_rr. The results are returned to the master application root. The results received from all the open application PDBs (east_app_pdb , west_app_pdb, north_app_pdb and south_app_pdb) across CDBs orclcdb and rmtcdb are aggregated in the master application root. Thus, even after relocation of the application PDB north_app_pdb from CDB orclcdb to rmtcdb, the query with the CONTAINERS clause, without any changes at all, can still aggregate application data from all the application PDBs across CDBs. Now, I will demonstrate application load balancing. The current setup corresponds to the configuration depicted in Fig. 1, above. Connect to CDB orclcdb and note that there is one application container sales_app_root in this CDB. Connect to application root sales_app_root and note that there are 3 application PDBs (north_app_pdb, east_app_pdb, west_app_pdb) and a proxy application PDB (px_app_root_rr) associated with it. Also, besides an implicit application, another application sales_app is currently installed in this container. All three application PDBs and the proxy PDB are synced with sales_app version 2.0. There is one common application object associated with the application sales_app; i.e., the metadata-linked table customers owned by sales_app_user. 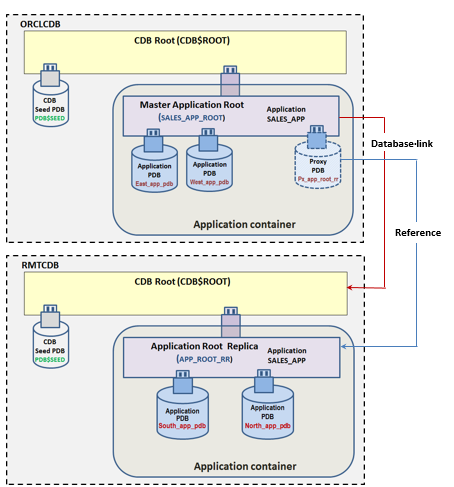 Connect to CDB rmtcdb and note that there is one application container root app_root_rr in this CDB. Note that by querying CDB_PDBS in sales_app_root, we learn that app_root_rr is the PDB referenced by the proxy PDB px_app_rr in the CDB orclcdb. The columns FOREIGN_CDB_DBID and FOREIGN_PDB_ID in CDB_PDBS display the DBID of the remote CDB (rmtcdb) and the CON_ID of the proxied PDB app_root_rr, respectively. Connect to application root app_root_rr and note that the application sales_app version 2.0 has been replicated in app_root_rr from the master application root sales_app_root by means of the proxy PDB px_app_root_rr. In other words, app_root_rr is a replica of the master application root sales_app_root. Note that there is one application PDB (south_app_pdb) associated with the application root replica app_root_rr. The application PDB south_app_pdb is synced with sales_app version 2.0. Let us view customer records in the application shared table sales_app_user.customers stored in application PDBs across orclcdb and rmtcdb. Note that there is one customer record in each of the four application PDBs. At present, there are three application PDBs in the CDB orclcdb and one application PDB in the CDB rmtcdb. Now, in order to load balance the application sales_app across CDBs orclcdb and rmtcdb, we will relocate the application PDB north_app_pdb from the CDB orclcdb to rmtcdb, so that the configuration becomes as shown in Fig 2, above. For relocation, we will leverage the Oracle Database 12.2 feature “Near-zero downtime PDB relocation” so that while connected to the target CDB rmtcdb, a single DDL statement will relocate the application PDB north_app_pdb by pulling it from the source CDB orclcdb . -- Create a database link from application root app_root_rr to source CDB orclcdb. -- While connected to application root app_root_rr in the target CDB rmtcdb, relocate the application PDB north_app_pdb from CDB orclcdb to rmtcdb via database link orclcdb_link. Note that the status of the target application PDB north_app_pdb in the target application root replica app_root_rr is ‘RELOCATING’ and that the source application PDB north_app_pdb is still visible in application root sales_app_root in the source CDB orclcdb. Even after relocation of application PDB north_app_pdb from orclcdb to rmtcdb, the earlier CONTAINERS query still aggregates application data from all the application PDBs across orclcdb and rmtcdb. Hence, we have been able to leverage a proxy PDB to load balance the application sales_app across CDBs orclcdb and rmtcdb without the need to modify the application code to aggregate application data across CDBs. Using proxy PDBs with application containers, location-transparent applications can be built which can aggregate data from multiple sources in the same data center or distributed across data centers. In order to keep an application synchronized across CDBs, a proxy PDB has to be created in the master application root for every application root replica in another CDB. The application PDBs plugged into the master application root and various synchronized application root replicas can be synchronized, so that they can access the latest version of the application while storing PDB-specific data in one or more metadata-linked tables. An application can be load balanced across CDBs by relocating one or more application PDBs across synchronized application containers, without any need to modify the application code to aggregate application data across CDBs.